Used Audi A8 Review - 2017-present Servicing, MPG, Insurance | What Car? What used Audi A8 saloon will I get for my budget? Prices for the A8 haven’t settled down. It’s still a relatively new car, and one with a high list price; that means there’s a long way for values to fall, so prices are changing constantly. That said, at the time of writing, you’d need about £48,000 to get into an entry-level A8 – about the same as a Mercedes S-Class, but more than a BMW 7 Series or Jaguar XJ. If you want to get a handle on the value of an Audi A8 you’re thinking of buying, why not check out our free What Car? Valuations tool? 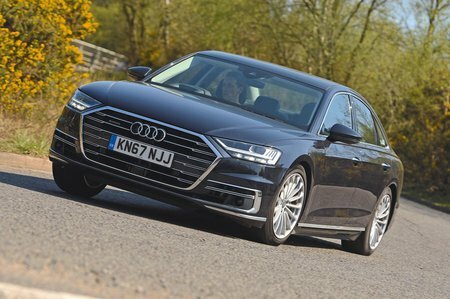 How much does it cost to run a Audi A8 saloon? According to its official fuel economy figures, the A8 isn’t as cheap as you might think to run. Diesel versions are a couple of MPG behind rivals like the Mercedes S-Class and BMW 7 Series, although they beat the Jaguar XJ. The same goes for the petrol version, which doesn’t compare all that well with the equivalent S-Class. Fortunately, all A8s were registered under the new flat-rate tax system so their slightly substandard fuel economy doesn’t have an effect on their tax costs. All A8s will set you back £450 a year to tax. Servicing costs, meanwhile, will be on a par with the A8’s luxury car rivals; however, once your A8 hits three years old, it’ll benefit from Audi’s fixed-price servicing scheme, which should keep service costs down at the main dealer.